Relatives: Son of John and Kate Tricker of Holton St Mary, husband of Ethel Tricker (nee Green) of Hadleigh. Address: (Employee) White Lion Hotel, High Street, Hadleigh. John Tricker was born in Holton St Mary but by 1901 he had moved to Hadleigh for work. He worked at the White Lion Hotel on the High Street where he was employed as the "boots", a live-in servant who would clean the guests shoes and carry out many other similar tasks. By the time of the 1911 census, he was still in the same employment. Towards the end of 1915 and at the age of 30 he married Hadleigh girl, Ethel Green. From the arrival of the British in the Arras sector in early 1916 New Zealand Tunneling Companies dug a network of tunnels in the ground underneath the Ronville and Saint-Saveur districts of Arras. They dug new tunnels and joined them up with the existing ancient tunnels and quarries already under the city, quarried out hundreds of years before. The tunnels were fitted with running water and electricity supplies. Accommodation in the underground city was available for the soldiers to live and sleep in and there was a large hospital for treating the wounded in a labyrinth of rooms with enough space to fit 700 beds and operating theatres. The tunnels and quarries created were named after New Zealand cities by the New Zealand Tunnellers. Today Wellington Quarries is a visitors centre and museum founded to the memory of the thousands of men who lived under the city during the Great War. He most likely enlisted under the Lord Derby Scheme at the end of 1915 and was subsequently mobilised in March 1916. 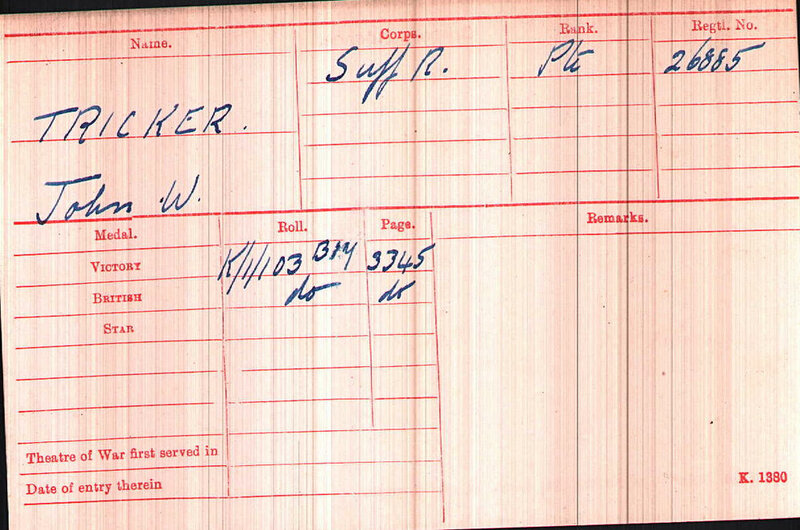 We are not sure exactly when he joined the 2nd Bn the Suffolk Regiment but it was probably during the summer of 1916. We know he was wounded at some point and it is most likely that he was wounded on the Somme when the 2nd Suffolks were in action at Serre in November 1916. He recovered and rejoined his unit early in 1917 in time for the Battle of Arras. The whereabouts of Private Tricker's medals is unknown, but he was entitled to the above two medals. In the lead up to the Battle of Arras the underground quarries provided a massive hidden assembly area where the British could amass their forces. The 2nd Suffolks were billeted in the Wellington quarries and evidence of this can be seen today through the graffiti scratched into the chalk walls of the tunnels. On Easter Sunday, the day before the battle, the Suffolks held a church service in one of the galleries and the scene was sketched by a soldier. In the early hours of the following morning exit tunnels and galleries would be blown open to allow the attackers to spill out directly into the German defensive positions. The Suffolks used exit 10. When the Suffolks emerged from the quarries in the early hours of 9 Apr 17 they were met by a blizzard with driving wind and snow. Despite this by 6am they had taken their first key objective, a strong point known as the HARP. Throughout the days that followed the battalion took their turn in the front line trenches. The fighting was fierce with over 4000 casualties each day and the weather conditions made matters worse. Soldiers out in the open would wake with a blanket of snow over them. Towards the end of April and into May the Suffolks were in a maze of trenches to the east of the village of Monchy-le-Preux and it was here that John Tricker was killed by enemy shell fire. His body was recovered and he is buried at the Feuchy Chapel British Cemetery, Wancourt. John William Tricker's memorial plaque (or death penny) recently appeared on eBay for sale and was purchased by the Hadleigh Great War Centenary Project. In July 2018, 38 pupils and 4 staff from Hadleigh High School visited the battlefields of northern France and Belgium. During the trip the group visited Arras and toured the Wellington Quarry where they heard the story of the 2nd Bn the Suffolk Regiment in the days leading up to the 1917 battle of Arras. 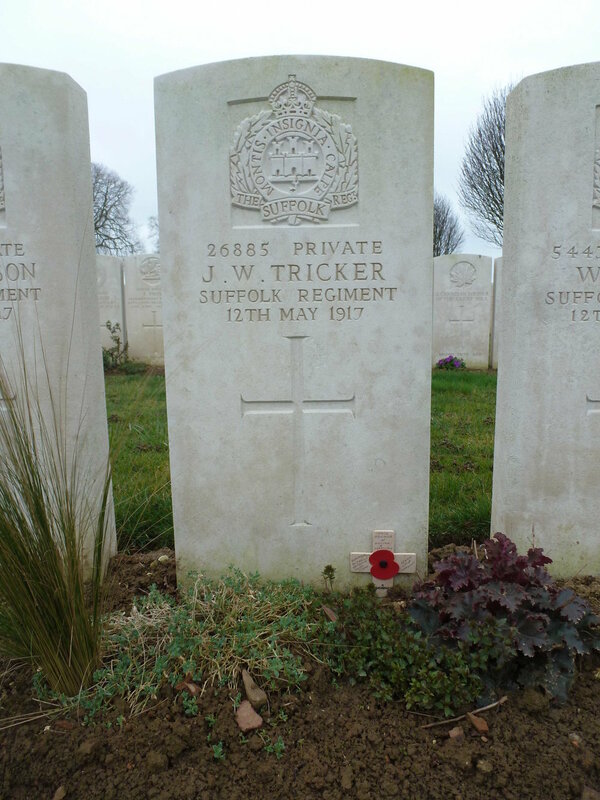 They also visited the grave of John Tricker at Feuchy Chapel British Cemetery, Wancourt. We hope that this page has been able to tell the story of John William Tricker. If you know of any information which might help to add to the story then please get in touch.